Prior to the Y2K USHCN adjustments, everybody (including Hansen) told us that there hadn’t been much (if any) warming in the US. As of 1999, the 1990s were much cooler than the 1930s. People who lived through both decades accepted that assessment. Then Hansen adjusted corrupted the temperature data, and instantaneously the downwards trend was converted into a trend of unprecedented warming – unlike anything humans had ever experienced. But for some reason, no one living in the US noticed the catastrophic unprecedented warming – until it appeared inside Hansen’s computer. It must have been the lamest catastrophe in history. 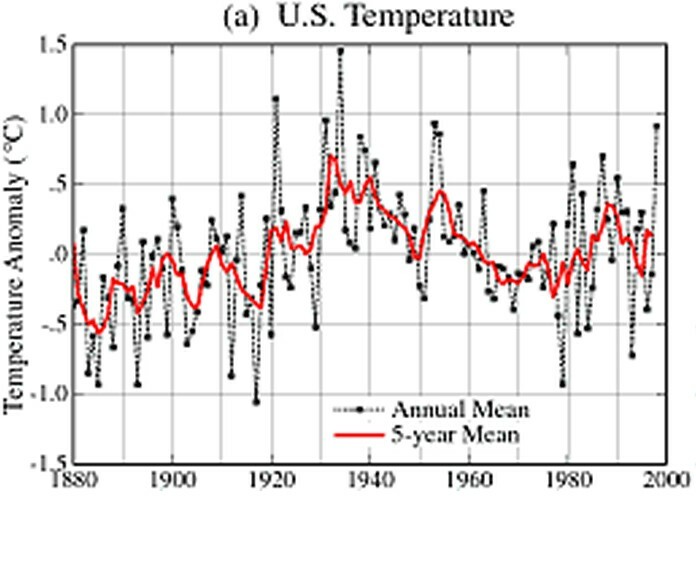 Since 1999, US temperatures have been declining. It’s hotter than heck out there, but we don’t notice squat. The “data” says it’s hotter than it’s ever been, but we don’t notice squat. As far as the areas I know, it’s colder than it’s ever been. So. California summers used to be hot, the last 4 summers in a row have been cool… seriously, cooler than it’s ever been. It’s always somewhere else. Yes, it’s cold where you are, but it’s hot in the Arctic, in the South Pacific, in Timbuktu. Where you are is the only spot where the sea level has just stayed the same, it’s everywhere else that the sea is rising faster than ever, about to flood half the country. Everytime big Jim makes an adjustment I have to turn down the thermostat.